Rome is a busy, crowded city and it can be difficult to find some peace and quiet, or open spaces for exercise. The best place to go to get some fresh air and a break from traditional sightseeing is the Villa Doria Pamphili, which is the largest landscaped public park in Rome and a wonderful place to spend a few hours. The park is huge with streams, a lake, lots of shaded areas and plenty of open grassy spaces; perfect for an early morning jog or stroll. The park is also ideal if you are travelling to Rome with kids because it provides a lovely natural outdoor area for family picnics and games, allowing children to blow off some steam. 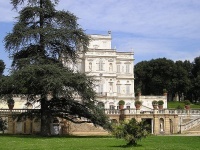 There are playgrounds, a skating rink and soccer fields to enjoy, and pony rides around the Villa Doria Pamphili are also great fun. There is a little restaurant for refreshments as well. The 17th-century villa, which gives the park its name, and features landscaped gardens, is not usually accessible to tourists but is interesting to see from the outside. The park is actually lovely all year, even in winter, though it is obviously at its best in good weather. Playgrounds and parks are hard to find in Rome which automatically makes Villa Doria Pamphili a big hit with families visiting the city.